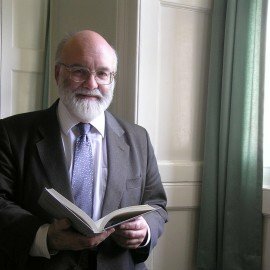 John Barton is Emeritus Oriel & Laing Professor of the Interpretation of Holy Scripture in the University of Oxford, an Emeritus Fellow of Oriel and St Cross Colleges, and a Senior Research Fellow at Campion Hall, Oxford. He is a Fellow of the British Academy. Among his publications are Reading the Old Testament (1984, several subsequent editions), The Nature of Biblical Criticism (2007), Ethics in Ancient Israel (2014), and most recently The Hebrew Bible: A Critical Companion (2016). He has also written several popular books on the Bible, but A History of the Bible, to be published by Penguin in 2019, will be his first trade book. He is joint editor of the Oxford Bible Commentary, and editor-in-chief of a major online encyclopaedia, the Oxford Research Encyclopedia of Religion. His books deal with the interpretation of the Bible, how it came together and became authoritative in Judaism and in the Church, and its theological and ethical themes—concentrating especially on the Old Testament. He is a priest in the Church of England, and has represented Oxford clergy on the Church’s General Synod.